Welcome, faithful readers (and those of you joining us for the first time) to the 118th installment of Cover Stories, the weekly column in which I, Jon B. Knutson, present a group of covers with a common theme! This week's column features the theme "Ch-ch-ch-changes," and it's all Superman family titles! As I'm sure most (if not all) of you know, the Silver Age Superman books featured strange transformations quite often... probably at least once per month, either Superman, Lois Lane, Jimmy Olsen, Superboy, Krypto, Supergirl, or one other cast member would experience some kind of bizarre change. Of course, the Kryptonians were most often transformed thanks to the unpredictable Red Kryptonite, but other times magic would be employed (or super-science). When it came to Jimmy, Lois, or other humans, it could be science or magic or something else entirely! These transformations could result in fondly-remembered stories, but more often than not, the stories would be as bizarre as the transformations themselves! 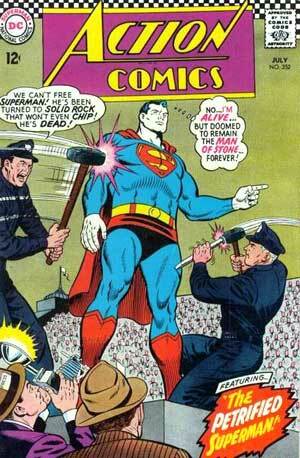 Let's start with Action Comics 352, featuring a Curt Swan cover. Here, the Man of Steel has somehow been transformed into a living statue of sorts (but not, apparently, his costume or his hair, which are all colored normally), and placed on a pedestal... apparently in Metropolis Stadium, judging from the crowds! You know, if I were Superman, after this particular adventure, I think I'd have a talk with the Metropolis Police about what to do in case of bizarre transformations. For example, I think I'd definitely tell them under no circumstances, if you think I've turned to stone, should you try and break me! I think that's a reasonable request to make. After all, what good would it do? "Hey, Sergeant, I just managed to break off Superman's hand! Yep, he's turned to stone all the way through." "Great! Now, maybe we can try and figure out how to reverse the effects of the transformation... and hope he doesn't mind no longer having a hand." The cover story, believe it or not, was "The Victory of Zha-Vam" by Otto Binder and Wayne Boring. Zha-Vam was a parody of Captain Marvel who beset Superman for a few issues. The name "Zha-Vam" was comprised of the initials of the Greek gods who gave him his powers (i.e., Zeus, Hercules, Achilles, Vulcan, Apollo and Mercury), and I believe he saw Lois Lane from his ancient Olympian times in a oracle's pool, and asked the gods for powers to woo her. When their original power set wasn't enough, he got other gods and Greek mythological creatures to give him their powers, too, but only good for one shot each, and stored in compartments on a belt he wore, which had each compartment initialed with the name of the person who gave him the power. It was when he pressed the G for Gorgon compartment that he got the Medusa stare that let him transform the Man of Steel to the Man of Stone. Also in this issue: Cap's Hobby Hints by Henry Boltinoff, and "Jimmy Olsen's Two Brides," a reprint from Jimmy Olsen #57 by Superman co-creator Jerry Siegel, with art by Curt Swan and Stan Kaye. In that tale, Jimmy meets Linda Danvers (aka Supergirl) and falls in love with her, not knowing she's really Supergirl (and I think Linda forgot she was Supergirl during their romance). After they marry, she remembers who she is, and decides to get Jimmy to fall in love with Supergirl, too, before she reveals her secret identity to him. Yes, it makes no sense, and yes, it's an Imaginary Story (but really, aren't they all?). Superboy 101 features probably the most infamous of Krypto's Red Kryptonite transformations! You can see on the cover that Krypto's been transformed into a super-collie... but what it doesn't say is that Krypto's been turned into a female collie! How did this happen, and why? Well, Krypto had been experiencing some issues with how he looked. Compared to, say, the DCU version of Lassie, he felt he wasn't that handsome. This was on his mind when he flew through the Red Kryptonite cloud pictured in his thoughts, and it changed him to whatever was on his mind at the time. And you can see why it's important, if you're a super-powered Kryptonian flying through space, to watch where you're going. 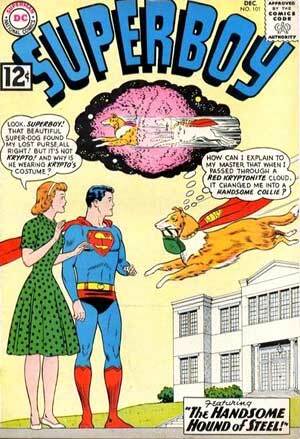 Apparently the DCU's version of Lassie was really a female collie (unlike the real Lassie, who's always been played by a male collie), because that's what Krypto became. Not only was he turned into a female collie, but before the story's done, Krypto has puppies, too! Wow, fast work there, Krypto... I'm guessing he was just transformed into a pregnant female collie, and didn't decide to experience what life was like in all ways as a female dog (because this is, after all, a Code-approved book). Fortunately for him, his puppies disappeared when the Red K wore off. This was another Curt Swan cover. Believe it or not, this wasn't the lead story in the book! That honor belongs to "The Valhalla of Super-Companions!," by George Papp, which featured the Legion of Super-Heroes (and was later reprinted in Adventure Comics #371 with alterations as "When Superboy Walked Out on the Legion." Also in this issue, a Peg filler by Boltinoff, an Ollie filler by Boltinoff, and then finally, "The Handsome Hound of Steel!" by Robert Bernstein and George Papp. The book's finished off with a Hy Wire filler by Boltinoff, and "Pennies for UNICEF!," a PSA starring Superman by Jack Schiff and Sheldon Moldoff. 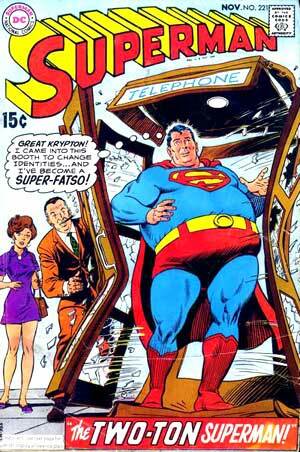 Here's another Curt Swan cover, on Superman 221, in which Superman becomes a Super-Fatso! I don't recall if I've ever read this story or not, but I suspect Red Kryptonite is the cause of this again. It's easy to see that turning into a fat person was something that was considered a really bad thing by Mort Weisinger in the 1960s... I recall a few "fat Lois" stories, and a "fat Jimmy" tale or two, as well... and I'm pretty sure there were a couple of other "fat Superman" tales, as well! Don't recall a "fat Supergirl" story, though. I'm sure this tale, like so many other Superman stories, was inspired by Mort's "board of advisors." You see, Mort reportedly would ask children what kind of stories they'd like to see in the Superman comics, and kids would say stuff like, "I want to see Superman become a fireman!" or, "I want to see Jimmy Olsen turn into a werewolf!" or, presumably, "I want to see Superman become a Super-Fatso!" Obviously not the kind of story we'd see published in this Politically Correct day and age, eh? Inside, we had "The Revolt of the Super-Slave!" by Leo Dorfman, Curt Swan, and George Roussos, in which Superman faces off against General Santana (presumably he later reformed and became a musician, eh?). Then there's a one-page pinup featuring the Superman Family by Curt Swan, Kurt Schaffenberger, and George Klein (which included the Legion of Super-Heroes as part of the Superman family, an honor they don't seem to have these days). Then we have "The Two-Ton Superman!" by Cary Bates, Curt Swan, and George Roussos. There's no villain in this story, just Stros, an alien... and now that I think of it, I think that Stros was the inadvertent cause of Superman's need to join Weight Watchers! Now, Lois Lane #40, with a Kurt Schaffenberger cover, is one that I have read... let's see how much I remember about it, shall we? As you can see from the cover, Lois has suddenly turned old, a situation which Lana Lang is only too happy to take advantage of (and isn't Lana looking fetching here? I always suspected Kurt preferred Lana to Lois, as it seems he always drew Lana sexier... or maybe it's the red hair?). Lana was always looking for an opportunity to take advantage of Lois' transformations, too... when Lois was turned into a baby, Lana cozied up to Superman right away, suggesting they get married and adopt baby Lois! If I recall correctly, Lois' aging was caused by some kind of magical curse... then again, it may have been some kind of science experiment gone awry. 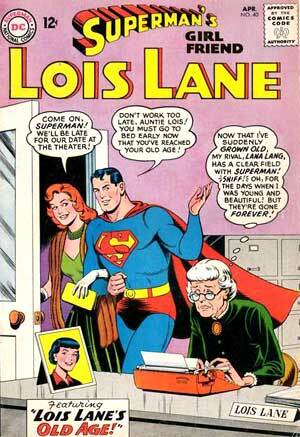 Either way, once Lois becomes old, Superman immediately makes a play for Lana, leaving Lois alone and feeling sorry for herself. Things keep getting worse and worse for "Auntie Lois," until finally she's had enough, and loses her temper! Which, naturally, is what she had to do to undo the effects of aging. A fact which Superman knew, of course, and that's the reason why he started doing everything he could to get Lois to get angry. I'm betting he also figured that if he did this without telling her that was the cure, it might teach her a lesson, too. Like that's ever worked for more than one issue in a row. "Lois Lane, Hag!" featured Schaffenberger art, and was reprinted in Lois Lane #95. This was followed by the PSA "Salute to Our Fellow Citizens of Puerto Rico!" which was written by Jack Schiff, then "Lois Lane, Foreign Correspondent!" with Schaffenberger art again, a Peg filler by Boltinoff, and then "The Lana Lang of 500 B.C.!" with, again, Schaffenberger art.